A leading organization for contract management professionals has honored Cal Poly Pomona College of Business Administration’s Contract Management emphasis with its top award in education. The National Contract Management Association invited Finance, Real Estate and Law professor John Wyatt to its world Congress 2017 event in Chicago, Illinois to accept the 2017 Contract Management Education Award on behalf of Cal Poly Pomona this July. For consideration, Wyatt completed a lengthy application outlining the CBA’s Contract Management program. In the 2016-2017 academic year alone, the department hosted internationally renowned author Kenneth J. Allen as well as guest lectures from accomplished alumni like General Atomics Aeronautical Systems senior director Derek Andrews and L.A. Metro contract manager Susan Dove. 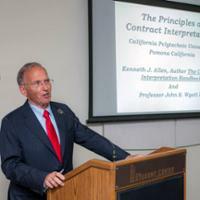 For information on how to get involved with the Contracts Management emphasis, please email cba@cpp.edu.